First we wish to thank Lisanne Walke of Rockin’ & Ridin’ for Autism for assisting us in this fundraiser. 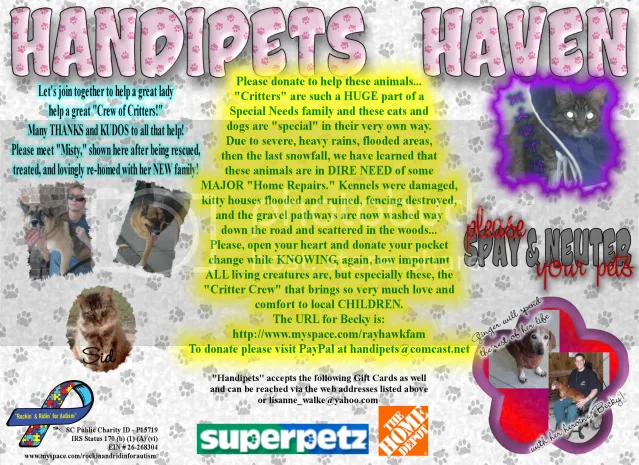 They created this awesome flier for us and are helping us promote this fundraiser in hopes that we can get our “Crippled Critters” into a larger, safe, private, community accepted, stockade kennel with feline containment netting. Dixie Thunder of Aiken County SC helped us raise funds to build a small lumber and wire mesh kennel for our special critters. Unfortunately weather and outside animals trying to get in took it’s toll on the kennel through 2009 and the 2010 South Carolina snowstorm finally destroyed it. We are spending precious funds on temporary patchups of a collapsing kennel when what we need is to build a new one. We can’t keep patching the existing one AND buy new fence panels at the same time. This is where we need help. We can keep patching the existing damaged kennel as long as someone is willing to help us buy new fence panels. Once we have all the fence panels we need we can begin erect the new fence, tear down the remains of the old one and recycle whatever we can to finish off the new one. We can accept gift cards for Superpetz as this is the only local store that sells the dry and canned foods we feed our crew. Helping us with animal food helps us put our funds toward fence panels. We can accept gift cards for Home Depot which has the lowest price stockade fence panels in our area and they have an E-Gift card program. We can accept gift cards for The Tractor Supply Company which has the right size wire mesh at the lowest cost in our area. We can pick up items purchased if you wish to just purchase one or more of the items we need and let the store know Amy Hawkinson will pick up.